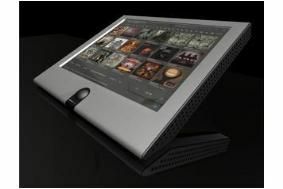 BRISTOL SHOW: Sooloos to launch two new touchscreen controllers | What Hi-Fi? This is the company's first major development since it was bought by Meridian Audio in late 2008. The new Sooloos Control 10 and Control 10 are designed to work in conjunction with Meridian's own home entertainment systems. Sooloos chief operating officer Peter Wellikoff says: "As the first fruit of the Soolos/Meridian integration, the new Control 10 and Control 20 incorporate Meridian's SpeakerLink inter-component connectivity, as well as legacy-standard Meridian Comms, making fully integrated Meridian/Sooloos systems incredibly simple." Along with Meridian connectivity, the new Sooloos touchscreens incorporate onboard S/PDIF coaxial digital outputs, permitting either to function as a complete Sooloos "zone" with the addition of any Meridian digital loudspeakers. The 15 inch, tabletop-style Control 20 uses an LCD display with a touch interface. It also comes with a simpler wireless infrared remote handset, and programmable volume knob, for use in secondary zones around the home. The Control 10 has a larger 17 inch LCD screen, and includes a slot-loading CD drive for local room playback without the need for a PC or outboard disc drive. Both the Control 10 and 20 communicate with Sooloos media storage and source components using standard TCP/IP Ethrnet connectivity, either via the supplied Neutrik EtherCon connectors or any conventional CAT5/5e/6 cabling. In a separate development, Meridian has announced that it will not be able to demo its 810 Reference Video System at the Bristol Show, as previously reported. Instead, in addition to the new Sooloos products, it will also be showing its 808.2 Signature Reference CD player and DSP 7200 speakers, as well as the new Meridian i80P iPod dock.